One way or another, we are finally coming to the end of a very frustrating and worrisome legislative session. As you are all aware by now, we are facing one of the biggest budget deficits we have ever faced as a district due to the disparate impact of the “McCleary fix” legislation. As we have said several times, we are not alone in this predicament, as most of our Thurston County school districts are facing cuts, as well as many others across the state. That being said, we take some solace in the fact that our projected budget deficit of $8.5 million could be reduced by as much as half if the Senate and House budgets make it out of the legislative session as they currently stand. Should that happen, the district has a reduction plan in place that will be shared with the school board on Monday, April 22, that will address our hopefully lower deficit without having to invoke a Reduction In Force (RIF) of teachers. Instead, the deficit will be handled through cost saving measures and not replacing a portion of central office, teacher and para-educator retirements and resignations. Both the Senate and House have bills that would allow districts like Olympia to collect higher local levies, but that is a serious point of contention in the Legislature. To that end, we, too, have no desire to raise our local levy. We would much rather Olympia receive regionalization funds, or adequate special education funding, or fully funded health care — all of which contribute to our deficit. But those “fixes” are said not to be forthcoming, and therefore a levy lift is currently the only way to avoid substantially deeper cuts. Unfortunately, we won’t have certainty on the final state funding plan until the close of the legislative session, which is scheduled for April 28. Until then, I want to again say thank you to all who participated in our budget informational sessions and our online survey. As always, you can get the latest budget and legislative information, including survey results, on a dedicated budget page on our district website. Thank you for your steadfast support of our school district. Veda Svs, an 8th grader at Marshall Middle School, won first place at the state science fair for her stellar project, “Turn that Sound Down.” Veda and three students from Jefferson Middle School placed in the top categories at the state science fair. Veda’s science project was inspired by her brother who is part of the Capital High School robotics club. When he is building robots in the workshop, he is required to wear headphones to avoid hearing damage. Veda’s science project explored the effects of noise pollution. She used an Arduino microphone, a breadboard, jumper wires and a fan, among other items. Her favorite part was “making the circuit actually work,” a process that took some problem solving. At Jefferson Middle School, 6th grader Shravya Gupta discovered inspiration for her science project in one of her other passions: gymnastics. “I was trying to figure out how our eyes and ears affect our balance,” Shravya said. She dubbed her project “Spinning, Twirling, Wow, my Head is Whirling.” Two of Shravya’s friends, a ballet dancer and a soccer player, helped her test her project using variables such as eyes open/closed and ear plugs. “We tested spinning ourselves in chairs,” Shravya said. She especially enjoyed learning about the human ear. She found she could apply her findings to gymnastics. Instead of closing her eyes when she completes flips in gymnastics, she now purposefully keeps her eyes open to reduce dizziness. She placed first in the junior division and Broadcom MASTERS, which will allow her to compete in the national competition. Aarav Verma, a 6th grader at Jefferson, created a project called “Wind to Works,” winning first place in the junior division and also Broadcom MASTERS. Aarav built a windmill from a 2-liter soda bottle, a Gatorade bottle and a metal rod. He crafted the windmill’s rotor from pieces of a robotics kit. He wanted to discover whether including a larger number of rotors would decrease the efficiency of the windmill. He especially enjoyed building the windmill. “It was a lot of fun,” he said. He is thankful to his teacher, Larissa Maughan, for her encouragement in his project. Aarav is also thankful to his family for their support. “My parents and my little brother helped so much in this,” he said. Aarav’s younger brother, Aaryan, a 3rd grader at Centennial Elementary School, recently took first place for his science experiment “Greasy Chips” in the South Sound Regional Science and Engineering Fair. Harshini Saravan, a 7th grader at Jefferson, competed for the first time in the senior division at state. Her science project was inspired by the flu. When her sister had the flu, she heard that it was a bad idea to eat a lot. She learned from her pediatrician that high body temperature affects metabolism — the process of breaking down food particles. Her science project “Speed it Up, Break it Down,” studied enzyme reactions and how they are affected by temperature using a solution from potatoes and hydrogen peroxide. She placed second at the state science fair. Harshini is especially thankful for the encouragement of teacher Katherine Halmos. If you see Veda, Shravya, Aarav or Harshini, be sure to ask them about their science projects! Each project is fascinating and reflects the enthusiasm of these young scientists. Tickets are on sale for our annual OSD Night with the Rainiers on Thursday, May 9. Come watch the Tacoma Rainiers take on the Reno Aces. Gates open at 5:30 p.m. 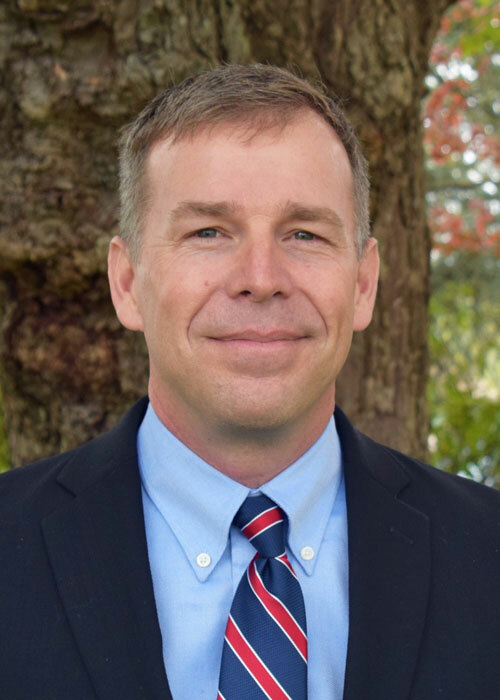 Superintendent Patrick Murphy will throw out the ceremonial first pitch at 6:45 p.m. followed by a performance of the national anthem by the Washington Middle School Choir. The game starts at 7:05 p.m.
To purchase tickets, please visit www.wertacoma.com/OSDNight and enter promo code OSD19. Group Express tickets are $14 per person and include a reserved seat, hot dog, chips and bottled water. The Double Play tickets are $19 per person and include a reserved seat, hot dog, chips, bottled water and a limited-edition Rainiers hat. All students, families, teachers, staff and the Olympia School District community are invited to join us for this fun-filled event. The waiver does not change any of the district’s high school graduation dates – all will proceed as scheduled this June. School year calendars posted on the district website have been updated to reflect the new last day of school for the 2018 -19 school year. 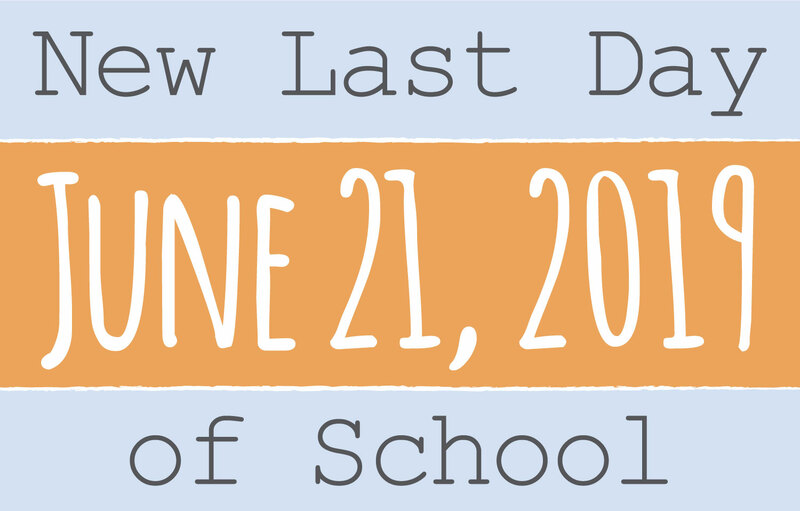 June 21 is a half day of school for students. Remember to update the Olympia School District wall calendar and other personal calendars to reflect the change. Also please note: Wednesday, June 19, will be a standard districtwide early release day. The Capital High School Thespians won multiple awards in the Washington State Thespian Festival 2019, held this year at Central Washington University. The festival included workshops, performances and awards. The following students scored in the top 10 percent at the festival and were invited to audition for the showcase: Ben Churchwell, Gracen Bayer and Johanna Chhay. Bayer’s “Stay True” was the Showcase winner for the Short Film IE category. Her film was shown during the festival’s opening ceremonies. This is the fifth year that the Capital High School Thespians have had a winner in this category. The following students were recognized with a score of excellent for their performances at the Individual Events competition: Nathan Altman, Lena Curry, Brenner Farr, Kaylene Sandoval, Phoenix Lowdermilk, Ben Churchwell, Johanna Chhay and Gracen Bayer. The troupe was also recognized as a Gold Medal troupe for the sixth year in a row. To win this title, troupes must complete a series of activities. This is the highest of three levels. Being named “Best in Fest” was the crowning accomplishment for the Capital High School Thespians. This is the highest honor given at the festival and is only awarded to schools with the top score. For this 2019 festival, Capital High School was the only school awarded this title. Capital Thespians won this award with the One-Act comedy, “The Hostage,” directed by Samantha Baker and Marina Ulrich. The stunning performance of “The Hostage” was acted by Kolby King, Brenner Farr and Phoenix Lowdermilk. The district has a telephone message line for Spanish-speaking families who have questions about the Olympia School District. This message line is designed to help families get answers to questions ranging from how to register for school or volunteer, to how to locate bus routes or daily lunch menus. An Olympia School District employee who is a Washington Certified Spanish Interpreter monitors the messages and responds to families with answers to their questions. The message line is open 24 hours a day, seven days a week year-round at (360) 596-7569. El distrito cuenta con una línea de mensajes telefónicos para familias que hablan español y que tienen preguntas sobre el Distrito Escolar de Olympia. Esta línea de mensajes está diseñada para ayudar a las familias a obtener respuestas a preguntas desde cómo inscribirse en la escuela, cómo ser voluntario, cómo localizar rutas de autobús o menús de almuerzo diario. 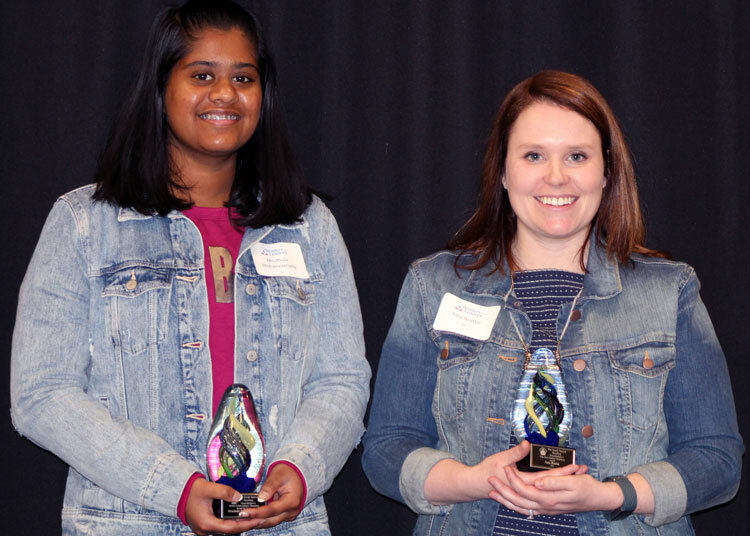 Congratulations to Garfield Elementary librarian Katy Beattie and Olympia High School freshman Mruthula Mohanvaanathi, who are this year’s South Sound Reading Foundation Adult and Youth Literacy Champion Award winners. Olympia School District Superintendent Patrick Murphy, School Board President Joellen Wilhelm, board member Frank Wilson, past board member Eileen Thomson and eight district staff members joined more than 200 guests at the breakfast on April 11. The Foundation called each winner forward to the stage, read their nomination and presented them with an engraved plaque at the annual breakfast held at the South Puget Sound Community College Lacey campus. An additional literacy award for business partner was awarded to Olympia Pediatrics. She is also a frequent storyteller at school assemblies, holds a Battle of the Books competition, has become “an exceptional” grant writer to fund more books and frequently builds baskets of books to support areas of focus for Garfield teachers. “She has created an environment that is a hub for our school,” Chertok wrote. Olympia High School ninth grader Mruthula Mohanvaanathi, nominated by her mother, served as a volunteer at the Boys and Girls Club after-school tutoring program in grades 6-8. As a volunteer, she visited the club two days a week to help students in grades 1-3 with their reading and math homework. She also read books to children and answered their questions, all while helping them try new vocabulary words. We are pleased to share our Annual Report, featuring highlights of the past year from throughout the Olympia School District. In this report, which features the 2017-18 school year, you will read about student and staff achievements, school performance reports, school bond construction updates, and how we are using the resources our community has entrusted to us to support student achievement. View the 2017-18 Annual Report on the Olympia School District website. It’s not every day legislators work alongside high school students to build and program robots. The FIRST robotics team from OSD and other neighboring school districts held their inaugural Legislator Invitational. Skunk Works, a robotics team from the Seattle area, gave a short presentation to the gathered legislators before dividing them into teams. The goal? Build a robot from LEGOS and program the robot to follow a black outline in the shape of Washington state. Four large tracks were set up in the center of the Columbia Room in the Legislative Building where the event was held. If programmed correctly, the color sensor attached to each robot would guide the robot around the track. The color sensor is just one of the sensors that FIRST teams use. Other commonly used sensors include gyro (movement), sonic (sound waves) and light sensors. Often, three or more sets of hands were working on the robot at one time. Each team was encouraged to brainstorm a team name. Teams included members of both Democrats and Republicans parties, which led to one team calling themselves the “Repocrats.” Another team named themselves “Team EVE” after the loveable robot in the movie “Wall-E.” “It’s the best movie there is,” one legislator said. A handful of "tribbles" — small, furry creatures from the Star Trek series — made a guest appearance at the friendly competition between teams. The FIRST teams are avid fans of Star Trek and a multitude of tribbles accompany them to each of their competitions and events. The tribbles are made of multicolored, faux fur with a squeaker inside. Senator Hunt also attended a portion of the event. He soon had a pink and purple tribble sticking out of his suit-jacket pocket. Brenda Diettrich, high school robotics coordinator, says the event was “a way for legislators to see what the money is doing.” The event was hosted by Rep. Vandana Slatter and Sen. Sharon Brown, co-chairs of the Science Innovation and Technology Caucus. For many students, this was their first time in the Capitol building. “They were in awe,” Diettrich said. Legislators were just as enthusiastic as the students as they rooted through LEGO bins and carried their completed product to the boards for a test run or two. What a fantastic opportunity for both students and legislators. Many schools in the Olympia School District, as well as schools across Thurston County, are participating in the May 1-15 School Bike Challenge, sponsored by Intercity Transit. The physical activity of biking to school improves health and is a good alternative to driving. Decreasing the number of cars on the road also means a cleaner environment. Students are encouraged to log their miles from May 1-15. Schools participating in this event will hand out a prize to students who log their miles during this time. Please reach out to your school’s office staff for the mileage log handout and additional information about the challenge. In the midst of the School Bike Challenge is National Bike to School Day, held on Wednesday, May 8. For more information, please visit Intercity Transit’s website. March Madness takes many forms. For Karen McGovern’s 8th-grade science class at Reeves Middle School, it meant an opportunity to study a variety of protected species from around the world. Students were divided into teams and given the opportunity to defend the animal they studied. Winning teams progressed to the next round. 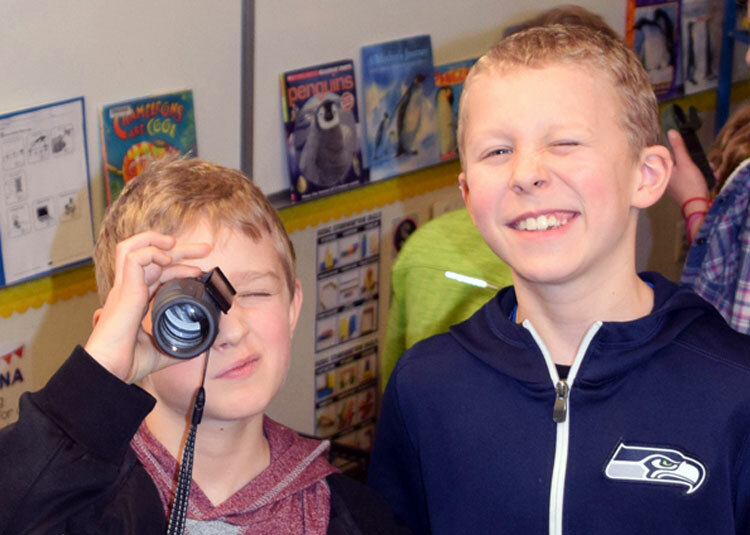 In the midst of this March Madness, McGovern’s class had a visit from some unique guests from West Sound Wildlife, located in Bainbridge Island. The first visitor presented to the class by her handler was a turkey vulture with the prestigious name “Princess Remington.” Once Remi warmed up to the class, one student even got a vulture bow, which her handler, Kathleen, called “a turkey vulture greeting.” Kathleen taught the students how to identify a vulture from a hawk or other large bird. “You’ll know it’s a vulture when you see the silver lining of its wings,” she told the students. Before Kathleen returned Remi to her crate, she left the students with a couple of interesting facts about vultures, saying, “The facts are gross, so you’ll probably remember them.” Kathleen asked the students if they knew how turkey vultures defend themselves. Hands flew up around the room. “Oh no!” Kathleen exclaimed, hiding a smile. “I thought I was going to surprise you.” The students had done their research well. Vultures do indeed regurgitate their food on predators to give themselves a chance to escape. The second and final visitor presented to the class had sustained head trauma before finding a home at West Sound Wildlife. “He is very imperfect and beautiful,” Fawn, the peregrine falcon’s handler, told the class. Fawn’s desire to care for the environment and the creatures within it began when she was a child, watching “Fern Gully.” Scout, the peregrine, perched on her glove, often tilting his head to watch Fawn. “He has sharp talons, curved beak, amazing eyesight. And he keeps looking at me because we feed him on the glove,” Fawn told the class. Scout has been with the West Sound Wildlife Shelter for just over a year. He originally came from Olympia. As Kathleen told the class early on, “These animals are still wild animals. They are not like a cat or a dog.” Fawn enjoys the opportunity to travel, educating people on how to be good stewards of their environment. 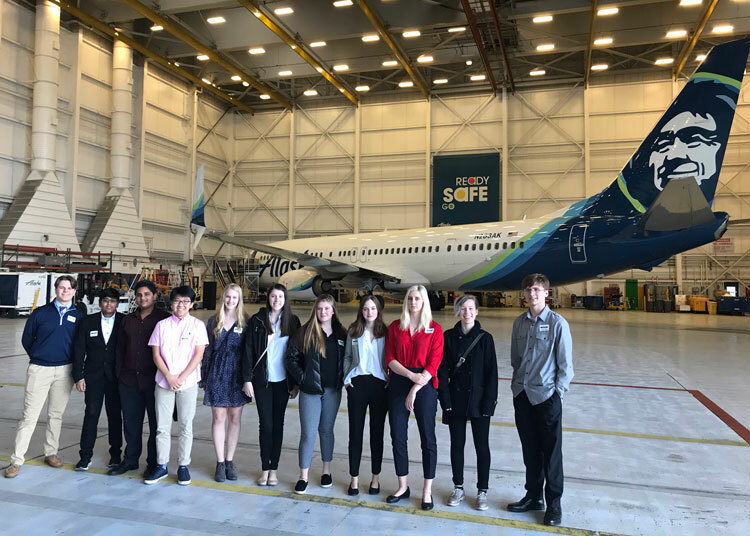 Skip Fabritius, a Career and Technical Education (CTE) teacher at Olympia High School, led his accounting students on a tour last month of Alaska Airlines in SeaTac. “The world of business is bigger than just a high school accounting course,” Fabritius says. 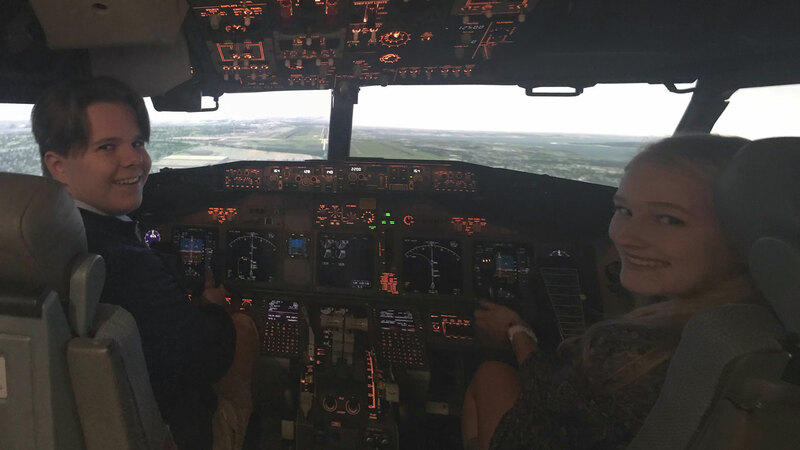 Trips like this give students a broad scope of the careers they are interested in, as well as how skills in the classroom apply in the work world. Brandon Pedersen, chief financial officer of Alaska Airlines, spoke with students about the career paths he took to get where he is now. “It helps you realize there are many paths to success,” Fabritius says. “Seeing how business works in a real life environment really emphasized what we learned in class in a big way,” Morgan Suttle, a sophomore at OHS, says. April 22 – Special Board Meeting: Knox Admin. Center, 6:30 - 8:30 p.m.
April 29 – Special Board Meeting: Knox Admin. Center, 6:30 - 8:30 p.m.
May 6 - Board Meeting: Olympia Regional Learning Academy at 6:30 p.m.
May 9 - OSD Night with the Rainiers – Cheney Stadium at 6:45 p.m.
May 14 - Elementary Parent Workshop: Anger: ORLA from 6:30 - 8:30 p.m.
May 20 - Board Meeting: Olympia High School at 6:30 p.m.
May 23 - Elementary Parent Workshop: Safety Without Fear at ORLA from 6:30 - 8:30 p.m.